Art, Puzzles, Story, just everything. "The deluxe version 'slightly' extends the original game's storyline and adds revamped backgrounds and voices to the mix, though the quality of the performances is a mixed bag. Overall, Ben Jordan Case 1 and its successors are not to be missed." The extra detail put into this definitely makes it a more enjoyable game than the original. Enjoyed this, looking forward to the rest of the series. Some puzzles are a bit obscure especially the final "do or die" one where certain things that seemed logical to me weren't allowed and the one correct action was not at all obvious, so I was frustrated at the end by repeatedly dying and reloading and eventually had to consult a walkthrough for that one final step of the game. loved it, need more games like thisss. I made the mistake of playing Ben Jordan 7 as my first Ben Jordan game and I had serious problems understanding the style, the themes, and the characters of the series. But now I've played this deluxe version of Case 1 and it was a blast. I'd describe Ben Jordan as an unique mix of Monkey Island and Gabriel Knight (with an emphasis on GK). I particularly enjoyed the atmosphere of the park (great use of sound indeed), the witty writing, the interactivity, the puzzles, the excellent music, and all those ranger type characters (including The Narrator). The only distracting (or even plain disturbing) element was Ben Jordan's classic "outfit". I do understand it's already an essential part of the character though. An excellent improvement over the original game 1! -Before, it was few things, but now, everything is good about it! Too short to be classified as medium length. This was fantastic. For some reason I just couldn't get into Ben's first case, but this deluxe version did the trick. I beat it rather quick, cause I couldn't stop playing. The puzzles were of decent challenge, and made sense. Pros: Great Adventure graphics, nice touch of sound, developed characters, challenging puzzles, humor. Cons: Ending should have extended a bit longer, the game could have been longer and some happenings were not explained well enough, did not make a lot of sense. Ive never played the original, just the remake. I liked the game. I like the humorous tone that was kept throughout the game- inter sped with violent scenes; its an odd combination but it worked. I didnt mind the voice acting: it added to the humorous tone- look out for the Christopher Walken impression. Some other comments suggested the plot was ridiculous/unbelievable, but I thought that was the point- its all part of the humor. Fun game, cant wait to play the others. Good game, good puzzles, poor storyline. The intro was long and drawn out, and at one point ridiculous. What 22-year-old with the brains to finish college is going to post on an online forum that he's in the ghost-busting biz and expect a SERIOUS response in a few weeks? And to actually get a response, and later actually get to handle evidence at the scene of a human death without any prior training? A little TOO implausible for my taste. I also found the scoring system unnecessary. Scoring in adventure games is more interesting if there are side puzzles and quests to complete for a perfect score. A perfect score in this game happens when you complete it, and that's a bit unfortunate. Still, a good game, and I'd recommend it, if for no other reason than because the series as a whole flows together well. 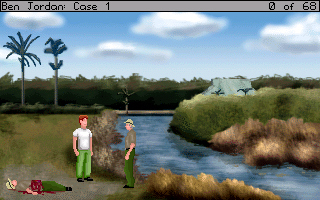 The puzzles were well-thought out and believable, and the graphics were what one would expect from an adventure game, which is to say, good without trying to be photorealistic. The voice acting was terrible, however. There were times where you could actually hear the actor adjusting his microphone, and the voices didn't really match the characters. It was a pretty good game. I little too short for me, but good. When you finish them all I suggest compiling them together as one game. Excellent reattempt. The changes that have been made have enhanced the storyline. Voice acting is rare in AGS games and this attempt was good. I haven't played the original but really wanted to get straight into the deluxe - it's my first play through of a BJ game and I was impressed enough to download all the others which I am very much looking forward to. The deluxe version is a bit better than the original concerning the different riddles you have to solve here which I like more. The speech pak didn't do it for me and at least it would be better if both the text would appear with the speach because it was hard to make it out alone. So I played the game without the speech. The story is still the same and the ending and solve of the mystery doesn't appeal for me. I really enjoyed playing the game. I was sufficiently intrigued and drawn back to playing again and again. Since playing the game, I decided I would try all the BJ games. I enjoyed this game. The puzzles took time to think about, and the voice overs cast for each role had feelings in it that made it believable for whats going on. I can't wait for more deluxe version of your other cases if any plans are in motion. Worth playing but be prepared for the gore. I found the premise of this game hard to believe. Not the supernatural elements. Though I'm not superstitious, I could suspend my belief for that. What I found hard to believe was that an amateur sleuth would be allowed to investigate murder scenes and handle (and take!) evidence. Even so, this is an interesting game. The graphics are decent enough and the puzzles are pretty good. The characterizations were okay. I did find the change in one character rather bizarre. And, personally, I didn't enjoy the gore. This is the first episode in the Ben Jordan game series, and as such, I recommend it. It is better than the Original Ben Jordan 1. A definitive improvment over the previous \"skunk-ape\". The puzzles made more sense compared to the original and the ending felt less \"tacked on\". The voice-acting is also adequately good. The only complaint i can think of is that the characters should have had some animations so they wouldn,t seem so dummy-like. Anyway, a surprisingly ambitious project that,s definitely worth playing. One of the best games I've seen. I just finished this and I replayed the original version as well to compare. It was really neat to see what you improved and touched up in the remake. The comic panel style cutscenes were a nice touch too and overall I'd say the remake is a success and I enjoyed it. However I must confess to shutting off the voices after a few minutes, they just didn't keep my interest and when that happens, I personally prefer to just read the text. Plus the vocal narration was too slow for my liking, I think it works better when the narration is silent in talkie games unless the character directly interacts with said narrator, otherwise it's a chore to wait for the descriptions to finish, especially when it's something generic repeated over and over again like 'You don't want to touch that' and so on. Anyway, I'm eagerly looking forward to Ben Jordan Case 6 and other future projects from you! Take care!